Ohio Manufacturing is not dead. At least, not from what I’ve seen. The manufacturers we work with, and there are more than you’d expect, have been growing these past few years. 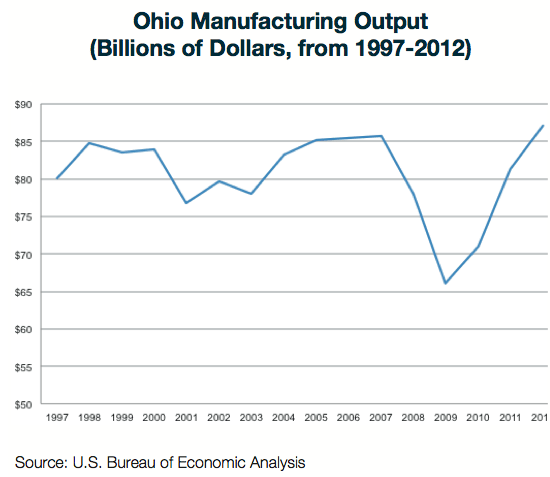 This is certainly supported by recent reports from the National Association of Manufacturers & the US Bureau of Economics, which reports that Ohio Manufacturing Output has not only recovered from the 2008 recession, but is now at historically high rates. Further, a recent article by from Jerry Jasinowski, Former President of the National Association of Manufacturers, reports the latest data from the ISM Manufacturing Index demonstrates seven consecutive months of growth as of December 2013. The Economic Outlook Group expects projects that business investment will increase by 7.3% in 2014, while the New Orders Index hit it’s highest level since April 2011. It’s impressive to note that while 91% of the manufacturers in Ohio have less than 100 employees, Ohio still ranks 5th in the US when looking at total production output. But are these NEO manufacturer’s merely treading water or are they GROWING? Unfortunately, many manufacturers don’t have the budget or resources to staff full fledged marketing departments. Most of the human capital is invested in creating great products. So, many times these responsibilities are falling to the Sales Department…Sales Managers, V.P. of Sales, or the business owners themselves. The result? An overwhelmed (and frustrated) Sales Department that’s expected to master all the ins-and-outs of online marketing (let alone all other media channels), all while building and maintaining the one-to-one relationships with new and existing customers. It’s practically impossible for manufacturers with small budgets to execute all of these marketing disciplines at a high-level. They’re just spread too thin. What’s worse, sales managers aren’t focused on doing what they do best. We work with manufacturers all over Northeast Ohio – Akron, Kent, Canton, Ravenna, Stow… in their efforts to consistently increase year or over year sales. So we see this a lot. There is a better way. These channels may have worked well over the years, but as markets increasingly become more competitive, global AND niche in nature, a better approach is needed…. an integrated marketing approach. Our job is to change that. Your website… nay… your entire Internet presence should serve as a major lead generation source for your company. All roads lead to Rome. The inside & outside sales reps should look to your site as a valuable resource for establishing trust and providing information to prospects. Trade show participants will pull up your site on their smartphones before / after visiting your booth, so it needs to reinforce the messages and the benefits your company offers. I generally don’t recommend change for change’s sake. We have never and will never try to convince someone they need a new website simply to make a buck. In fact, we’ve had people come to us with ugly sites asking for us to redesign them. We ask them ‘why?’ and the answer is most commonly that it’s old and embarrassing. In my book, that’s not a reason to spend money on a redesign. The only justifiable reason is if a redesign is going to result growing your business. Does your site address full breadth of services your company offers? Business models change, new products and capabilities are introduced….innovation happens. Unfortunately, many companies neglect to update their website with an accurate listing of exactly what they have to offer. Is your site’s visibility limited in the Google, Bing & Yahoo due to minor technical errors? Does your site position your brand in a way that creates trust in the company? This is where you care about a site that might be ’embarrassing’. People looking up your site from a Trade show floor should be impressed enough to visit your booth and learn more. Outside sales reps should have a reputable site to point to which helps them sell the benefits of working with your organization. Is your site designed for mobile users? For most of the manufacturers we serve, 15-40% of the people visiting their site are on mobile phones. Does you website capitalize on Social Media and all it has to offer? Ok, Facebook may not be right for industrial manufacturers. But LinkedIn, Google+…these channels can serve the B2B market very well. Does your site have powerful, ‘shareable’ content? Does it provide tangible examples that people in your target industries can relate to? Site visitors engage with content that is applicable to their SPECIFIC need. Application-based content demonstrating how your products or services filled a need help potential buyers understand how you can solve their unique problems. Is your site designed for conversion with compelling ‘calls-to-action’? Does your website give people a reason to pick up the phone and call? Design elements should draw their eye, simple forms should invite them to act, and actionable offers should incetivize them to get started immediately (e.g. schedule a quality audit, tour etc.). 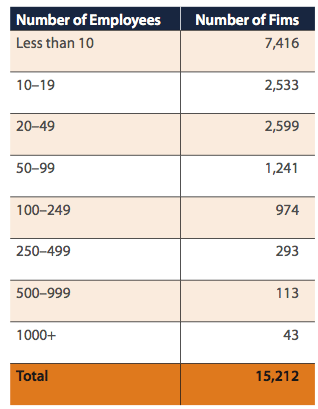 What should you expect as far as the volume of leads? 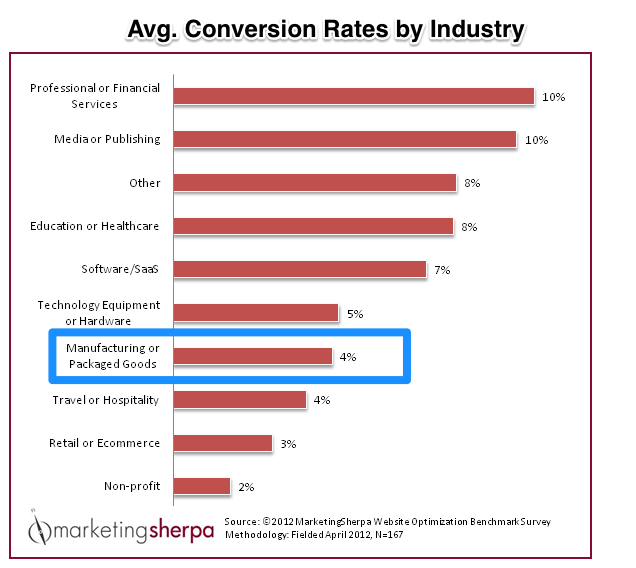 While every company is different, the average manufacturing company’s conversion rate is 4%, according to a survey from MarketingSherpa. That said, any baseline metric is only a starting point. The goal is to establish a system of continuous improvement. How can NEO manufacturers grow their business using SEO? Search Engine Optimization is not about increasing the volume of people visiting your site. It’s about growing your businesses. The idea is to drive RELEVANT traffic (potential customers) to your site and to get them to take ACTION by contacting the company. In that sense, the focus word is ‘OPTIMIZATION.’ Getting the optimal balance of relevant traffic and revenue generating sales leads. Right now, at this very moment, someone is searching for a service you offer. It’s true. Someone is pulling up their browser and typing a very specific search string into their browser. Will they find your website…or your competitors? I’m not trying to scare you, its a legitimate question. 60-70% of the visitors to your site SHOULD be coming from organic (free) search. But most companies don’t even know how many unique visitors are coming to their site on a monthly basis….let alone where they are coming from. We often hear customers declare that their customers don’t use the Internet, or that all the players know in their industry, or that no one would ever search for them using a mobile phone. But most times these statements are subjective assumptions based on anecdotal evidence. We find that when we measure ACTUAL results using a free tool like Google Analytics we’re able to understand the real behavior patterns of current and potential. Only by understanding this behavior, can we formulate a strategy to increase the volume of sales leads generated by a website. What works for manufacturing companies? Content is king. Creating great content that serves your target audience will attract your potential customers. Blogging may be appropriate but great content comes in many forms; Landing pages, ebooks, case studies, technical or scientific articles, etc. Content works when it’s specific and actionable for the reader. For supply-side manufacturer’s, this tends to be content which serves engineers, project managers and business owners seeking an engineered solution. Case studies – People love success stories. Case studies provide insight into the real world applications of your product or service AND demonstrate a track record of how your company can execute. Product specifications – Details. Details. Most of the manufacturer’s we deal with have a product which fills a certain role within a very technical manufacturing process. Engineers need specifics to understand how best to integrate your product into that process and documentation on how it will solve their problem. Simply saying ‘contact us’ may just be incentive enough for a researcher to move on to the next candidate. Further, Google values detail oriented sites so a site that demonstrates a history of being a good resource for people in your industry will move up in the search rankings. Chances are you can provide technical information while still protecting proprietary secrets from competitors. We have one small manufacturer that receives 200+ new email leads every month by downloading product guides and engineering specifications. Industrial based content – What industries do you serve? If you are able to identify a strength in 3-5 industries (ex. medical, aerospace, transportation, etc. ), you target content specific to their needs and how the product can fill a specific need. Application-based content – Application based content demonstrates specific uses of your product or service ‘in action.’ Most websites try to paint a broad brush so that they aren’t pigeon-holed into any one implementation. The fear is you’ll turn away a potential customer because they don’t see their specific application. There’s also a concern that they are limiting themselves when the product has an infinite array of applications in a manufacturing process. The goal is not to limit your company’s appeal, but to speak directly to their unique needs & interests. The site can be structured in a way that addresses these concerns without limiting its appeal to the broader audience. Make no mistake. Your site is no longer a static piece of brochure-ware that you’ll touch up once every 3-5 years. It’s an organic-living thing that requires constant attention and needs to be infused with new content on an ongoing basis. How fast you roll out that content depends on how aggressive you want to be. But we find slow and steady wins the race. The idea is to inventory all of these content opportunities, prioritize them based on where you think you’ll have the most bang for the buck, and then systematically roll out new content on a month-by-month basis. A year goes by in a hurry, so before long your website will grow from 10 pages to 100s. Which will increase not only it’s relevance to specific markets but also its ‘weight’ in the eyes of search engines like Google. Why does SEO work for the manufacturing industry? Engineers, project managers, business owners are usually looking for a specific solution to a very specific problem with certain industrial applications. They’re in meetings and onsite reviewing projects and searching for solutions on their mobile phones. They aren’t looking to ‘talk’ to you to see if you might provide a solution. They want more evidence before they are even going to consider submitting an RFP or picking up the phone. Increasingly, Google isn’t delivering visitors to your ‘home page’. The traffic is being sent to nested landing pages WITHIN your site – a couple layers down. Google is trying to match the best site with the best PIECE of content on that site based on whatever query the user typed in. You’ve got a few seconds to convince them that they should stay, learn more, and contact you to speak with an internal specialist. Hey, I realize this is a little forward — but give us a call. We’re always happy to give a free Internet marketing assessment. There’s no obligation and no high-pressure sales tactics. You get a handy little report looking at 38 unique dimensions of your online marketing presence. Once complete, we’ll review the assessment with you page by page, and you can take it with you as you consider your options — even if it’s looking at other online marketing firms.